A southerner by birth and a westerner by heart, that’s Jay Hester. 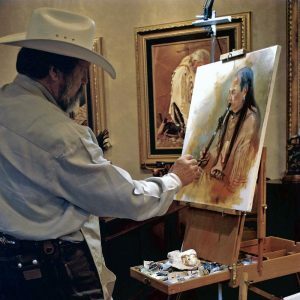 Jay’s passion for Western culture is evident in his work as a Native American and Western artist. His ability to capture the rustic beauty and depth of the people and places that define the American West has gained him many honors and awards at national juried exhibitions. Although this subject matter is his passion, it by no means encompasses the spectrum of his talent. After college graduation in Alabama, Jay was accepted to the prestigious Art Center College of Design in Los Angeles which further refined his painting skills. He then worked as an illustrator for Lockheed Aircraft Corporation in Georgia. After several years in the commercial art business, Jay realized his dream to paint and sculpt full time. He followed his passion along the East Coast art show circuit, and taught art to college students in Georgia and Tennessee before heading west. It was Santa Fe with its rich environment that sparked his interest in the Native Americans and other western subjects. While residing there he studied the character of the west, its culture and traditions, enabling him to capture on canvas and in clay the Native Americans, mountain men, and cowboys he so often depicts. Those artistic pursuits have gained him notable recognition. In addition to private collections across America, Jay has produced commissioned paintings for Texas Tech University and Methodist Hospital in Lubbock, the Zaragosa Theater at Six Flags Fiesta Texas, USAA in San Antonio, as well as many other public collections. His monumental bronze sculptures grace The Woodlands, near Houston, Driscoll Children’s Hospital in Corpus Christi, and Boerne’s Veteran’s Park. “Lasting Friendship”, in Fredericksburg’s Markt Platz, is represented by three heroic size figures depicting the treaty signing between the Comanche Indians and the German settlers and was unveiled on the 150th anniversary of the city. Jay has resided in the beautiful Hill Country town of Boerne, Texas for over twenty years and has been an active leader during the expansion of the arts in this rapidly growing area.